The most specified fog machine in the world. 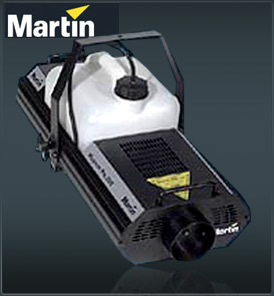 The Martin Magnum Pro 2000 is the authority in portable fog machines. Few other portable foggers can match the optional DMX controlled output of the Martin Magnum Pro 2000, or its logical plug and fog simplicity. The well established Martin Magnum Pro 2000 uses microprocessor-based technology in conjunction with a specially designed heating element offering long life and reliability. Greatly appreciated by rental companies, this hand-held remote can be stored during transit on-board the machine, making it easy to find at show time and eliminating transit vulnerability. But storage isn´t the only advantage. Portability is greatly enhanced by having on board controls.